Hi everyone, long time lurker, first time poster. Just picked these Heresy’s up locally in Melbourne and trying to work out the year of manufacture. I’m guessing pretty early but couldn’t work it out using the serial number code on ‘that’ thread. There isn't any etching from what I can see. These have had some nice mods - Some sort of silicon seal on the horn, that pad on the back wall to tighten the bottom end. The crossover is E-2, K-22-K woofer, K-77 tweeter and hard to tell what it says on the back of mid-horn driver. Serial no. 127 is all I got! 1983-1984: The K-24 woofer is substituted for the K-22, and during the last production of the Heresy-I, the midrange K-53/701 is substituted for the K-55/700. It is good that you also have the original back panels. Keep them, because you may want to put them back on. I left the Hope, AR facility in September 1983...and these were made around that era. SO:....here is what I believe you have: SOMETIME before I left, the company was establishing an overseas production facility to produce the Heritage speakers which had HIGH-VOLUME sales overseas, and the Heresy had the HIGHEST sales volume overseas at the time. Sales of Klipsch speakers had done very well in Japan over the years, with MOST of the models being sold there being K-horns...so the smart move would have been to put that facility in Japan...WHY?? Because the sales of the Heresy would sky-rocket there if they were being built there! To have started production of the K-horn and/or the Belles there would have been folly, though...because those sales were driven by "Made in USA" being on them! Make sense? SO, what I think you have is a "Made in Japan" pair of Heresy speakers from about the time I left the Hope facility. ALSO, to back this theory up, if the facility was relatively new, then its employees would ALSO be relatively new, and this explains the vast discrepancy between the tag info of your tags, and what was SUPPOSED TO BE on the tag info, if made in Hope, AR. Another thing to back up my theory is that Australian Heresy sales would have come out of the Japan facility instead of the Hope facility...also to save on shipping costs. OK, now to get to the speaker backs....and a POTENTIAL issue with them. That "rubber pad" you see is a drone (passive radiator) designed to flex inwards and/or outwards. Drones work best when the cabinet design is conducive to their use. The Heresy cabinet is designed to be an "airtight" cabinet...for a reason. The reason has to do with the K22 woofer used in the Heresy! This woofer is a SHORT-EXCURSION woofer. The Heresy speaker cabinet interior AIR VOLUME ties into the use of the SHORT-excursion woofer. Here is how it works: If the woofer cone moves forward the PRESSURE of that interior air-volume goes down, thereby creating a "sucking" effect on the rear of the woofer cone, and slowing down and LIMITING its ability too move TOO FAR forward....when the woofer come moves REARWARD, the cabinet air volume pressure INCREASES and "pushes" more against the rear of the woofer cone slowing down its rearward motion and LIMITING how far rearward it can go. Make sense? A flexible drone like what you have will negate (at east to SOME extent!) the effect of the cabinet design as far as interior air-volume air-pressure increases and reductions go. The cabinet design is like a band-aid effect to keep the short-excursion K22 woofer from SLAMMING its voice coil...what the drone does is take off the band-aid! Make sense?? This is not such a big deal at MODERATE volumes when the speaker is being driven with low wattage, but as the volume goes up, the more of a problem it can be...depending upon how many watts are being thrown at the woofer, and the complexity of the musical passages! 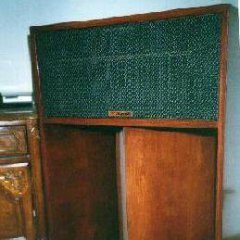 PWK designed the speaker cabinet to save the life of a short-excursion woofer when the woofer is driven at high volumes....MAKE SENSE?? Thank you for the detailed reply... I set the original back panel on them and do find I get a bit more bottom end with the drone, it also feels a little tighter using them. I do tend to like my music on the louder side so perhaps I'll stick with the original backs for now. Yes, you will think you are getting more bottom end with the drone, but what "more' you get..is not as tight, because what you are hearing is actually a rear-wall reflection....but in the case of the Heresy, the bass you get will be much tighter without the drone....and you also have fewer worries of the voice-coil slamming at high volumes using loads of wattage. I never even really feel a need more than 25 WPC max for My Heresys….at high volumes they will run you out of the small room they are in with way less actually being used! IMHO, the Heresys have always deserved "first prize for anything their size"! What Andy said! The date code on the woofer is the 19th week of 1984, so some time after that for a production date. The damping on the squawker horn may help, but I couldn't tell any difference in my Heresies. The K-700 horn is pretty short and thus relatively stiff. If the sound is dull, not forward and out in the room, consider replacing the capacitors. I'd recommend a film and foil type, over a metallized film type, but expect to pay well for them. It is possible the passive radiator was correctly chosen to augment the lower bass, but, now, only testing will tell. I have and would recommend using the original rear panel and adding a nice subwoofer. Heresies don't play really low bass, but what they do play should be tight and clean. I wish i knew what was available in Oz to recommend one, but not smaller than 12" (15" better) to keep distortion levels comparable to the Heresy. . Thanks for that Jim...because I knew that that the overseas facility was under consideration, but never actually knew if was ever established!!! And the labels show "USA, Canada, and Japan"...so I assumed.....Japan?? See ya at the Pilgrimage...I am arriving on Tuesday afternoon, but if you need help moving archives stuff, I can arrive even earlier, provided you let me know very soon, so that adjust my room reservation start date! You have a PM!